Not to be confused with Factor V (NAD+) found in Chocolate agar. This article is about the blood coagulation protein. For the software company, see Factor 5. 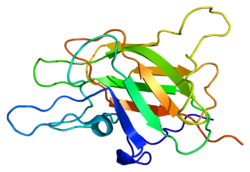 Factor V (pronounced factor five) is a protein of the coagulation system, rarely referred to as proaccelerin or labile factor. In contrast to most other coagulation factors, it is not enzymatically active but functions as a cofactor. Deficiency leads to predisposition for hemorrhage, while some mutations (most notably factor V Leiden) predispose for thrombosis. Factor V protein consists of six domains: A1-A2-B-A3-C1-C2. The A domains are homologous to the A domains of the copper-binding protein ceruloplasmin, and form a triangular as in that protein. A copper ion is bound in the A1-A3 interface, and A3 interacts with the plasma. Activation of factor V to factor Va is done by cleavage and release of the B domain, after which the protein no longer assists in activating protein C. The protein is now divided to a heavy chain, consisting of the A1-A2 domains, and a light chain, consisting of the A3-C1-C2 domains. Both form non-covalently a complex in a calcium-dependent manner. This complex is the pro-coagulant factor Va. Factor V synthesis occurs in the liver, principally. The molecule circulates in plasma as a single-chain molecule with a plasma half-life of 12–36 hours. Factor V is able to bind to activated platelets and is activated by thrombin. On activation, factor V is spliced in two chains (heavy and light chain with molecular masses of 110000 and 73000, respectively) which are noncovalently bound to each other by calcium. The thereby activated factor V (now called FVa) is a cofactor of the prothrombinase complex: The activated factor X (FXa) enzyme requires calcium and activated factor V to convert prothrombin to thrombin on the cell surface membrane. Factor Va is degraded by activated protein C, one of the principal physiological inhibitors of coagulation. In the presence of thrombomodulin, thrombin acts to decrease clotting by activating Protein C; therefore, the concentration and action of protein C are important determinants in the negative feedback loop through which thrombin limits its own activation. Various hereditary disorders of factor V are known. Deficiency is associated with a rare mild form of hemophilia (termed parahemophilia or Owren parahemophilia), the incidence of which is about 1:1,000,000. It inherits in an autosomal recessive fashion. Other mutations of factor V are associated with venous thrombosis. They are the most common hereditary causes for thrombophilia (a tendency to form blood clots). The most common one of these, factor V Leiden, is due to the replacement of an arginine residue with glutamine at amino acid position 506 (R506Q). All prothrombotic factor V mutations (factor V Leiden, factor V Cambridge, factor V Hong Kong) make it resistant to cleavage by activated protein C ("APC resistance"). It therefore remains active and increases the rate of thrombin generation. Until the discovery of factor V, coagulation was regarded as a product of four factors: calcium (IV) and thrombokinase (III) together acting on prothrombin (II) to produce fibrinogen (I); this model had been outlined by Paul Morawitz in 1905. The suggestion that an additional factor might exist was made by Dr Paul Owren (1905–1990), a Norwegian physician, during his investigations into the bleeding tendency of a lady called Mary (1914–2002). She had suffered from nosebleeds and menorrhagia (excessive menstrual blood loss) for most her life, and was found to have a prolonged prothrombin time, suggesting either vitamin K deficiency or chronic liver disease leading to prothrombin deficiency. However, neither were the case, and Owren demonstrated this by correcting the abnormality with plasma from which prothrombin had been removed. Using Mary's serum as index, he found that the "missing" factor, which he labeled V (I–IV having been used in Morawitz' model), had particular characteristics. Most investigations were performed during the Second World War, and while Owren published his results in Norway in 1944, he could not publish them internationally until the war was over. They appeared finally in The Lancet in 1947. The possibility of an extra coagulation factor was initially resisted on methodological grounds by Drs Armand Quick and Walter Seegers, both world authorities in coagulation. Confirmatory studies from other groups led to their final approval several years later. Owren initially felt that factor V (labile factor or proaccelerin) activated another factor, which he named VI. VI was the factor that accelerated the conversion from prothrombin to thrombin. It was later discovered that factor V was "converted" (activated) by thrombin itself, and later still that factor VI was simply the activated form of factor V.
The complete amino acid sequence of the protein was published in 1987. In 1994 factor V Leiden, resistant to inactivation by protein C, was described; this abnormality is the most common genetic cause for thrombosis. Factor V has been shown to interact with Protein S.
^ Villoutreix BO, Dahlbäck B (June 1998). "Structural investigation of the A domains of human blood coagulation factor V by molecular modeling". Protein Science. 7 (6): 1317–25. doi:10.1002/pro.5560070607. PMC 2144041. PMID 9655335. ^ a b Thorelli E, Kaufman RJ, Dahlbäck B (June 1998). "The C-terminal region of the factor V B-domain is crucial for the anticoagulant activity of factor V". The Journal of Biological Chemistry. 273 (26): 16140–45. doi:10.1074/jbc.273.26.16140. PMID 9632668. ^ Macedo-Ribeiro S, Bode W, Huber R, Quinn-Allen MA, Kim SW, Ortel TL, Bourenkov GP, Bartunik HD, Stubbs MT, Kane WH, Fuentes-Prior P (November 1999). "Crystal structures of the membrane-binding C2 domain of human coagulation factor V". Nature. 402 (6760): 434–39. doi:10.1038/46594. PMID 10586886. ^ Huang JN, Koerper MA (November 2008). "Factor V deficiency: a concise review". Haemophilia. 14 (6): 1164–69. doi:10.1111/j.1365-2516.2008.01785.x. PMID 19141156. ^ a b c d Stormorken H (February 2003). "The discovery of factor V: a tricky clotting factor". Journal of Thrombosis and Haemostasis. 1 (2): 206–13. doi:10.1046/j.1538-7836.2003.00043.x. PMID 12871488. ^ Owren PA (April 1947). "Parahaemophilia; haemorrhagic diathesis due to absence of a previously unknown clotting factor". Lancet. 1 (6449): 446–48. doi:10.1016/S0140-6736(47)91941-7. PMID 20293060. ^ Jenny RJ, Pittman DD, Toole JJ, Kriz RW, Aldape RA, Hewick RM, Kaufman RJ, Mann KG (July 1987). 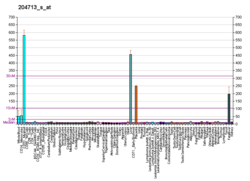 "Complete cDNA and derived amino acid sequence of human factor V". Proceedings of the National Academy of Sciences of the United States of America. 84 (14): 4846–50. doi:10.1073/pnas.84.14.4846. PMC 305202. PMID 3110773. ^ Bertina RM, Koeleman BP, Koster T, Rosendaal FR, Dirven RJ, de Ronde H, van der Velden PA, Reitsma PH (May 1994). "Mutation in blood coagulation factor V associated with resistance to activated protein C". Nature. 369 (6475): 64–67. doi:10.1038/369064a0. PMID 8164741. ^ Heeb MJ, Kojima Y, Rosing J, Tans G, Griffin JH (December 1999). "C-terminal residues 621–635 of protein S are essential for binding to factor Va". The Journal of Biological Chemistry. 274 (51): 36187–92. doi:10.1074/jbc.274.51.36187. PMID 10593904. ^ Heeb MJ, Mesters RM, Tans G, Rosing J, Griffin JH (February 1993). "Binding of protein S to factor Va associated with inhibition of prothrombinase that is independent of activated protein C". The Journal of Biological Chemistry. 268 (4): 2872–77. PMID 8428962. Nicolaes GA, Dahlbäck B (April 2002). "Factor V and thrombotic disease: description of a janus-faced protein". Arteriosclerosis, Thrombosis, and Vascular Biology. 22 (4): 530–38. doi:10.1161/01.ATV.0000012665.51263.B7. PMID 11950687. Segers K, Dahlbäck B, Nicolaes GA (September 2007). "Coagulation factor V and thrombophilia: background and mechanisms". Thrombosis and Haemostasis. 98 (3): 530–42. doi:10.1160/th07-02-0150. PMID 17849041. Hooper WC, De Staercke C (2006). "The relationship between FV Leiden and pulmonary embolism". Respiratory Research. 3 (1): 8. doi:10.1186/rr180. PMC 64819. PMID 11806843. Schrijver I, Houissa-Kastally R, Jones CD, Garcia KC, Zehnder JL (February 2002). "Novel factor V C2-domain mutation (R2074H) in two families with factor V deficiency and bleeding". Thrombosis and Haemostasis. 87 (2): 294–99. doi:10.1055/s-0037-1612988. PMID 11858490. Mann KG, Kalafatis M (January 2003). "Factor V: a combination of Dr Jekyll and Mr Hyde". Blood. 101 (1): 20–30. doi:10.1182/blood-2002-01-0290. PMID 12393635. Duga S, Asselta R, Tenchini ML (August 2004). "Coagulation factor V". The International Journal of Biochemistry & Cell Biology. 36 (8): 1393–99. doi:10.1016/j.biocel.2003.08.002. PMID 15147718. Andreassi MG, Botto N, Maffei S (2006). "Factor V Leiden, prothrombin G20210A substitution and hormone therapy: indications for molecular screening". Clinical Chemistry and Laboratory Medicine. 44 (5): 514–21. doi:10.1515/CCLM.2006.103. PMID 16681418. Du X (May 2007). "Signaling and regulation of the platelet glycoprotein Ib-IX-V complex". Current Opinion in Hematology. 14 (3): 262–69. doi:10.1097/MOH.0b013e3280dce51a. PMID 17414217.